50s classic – he knows all the answers! How does he know the answers? 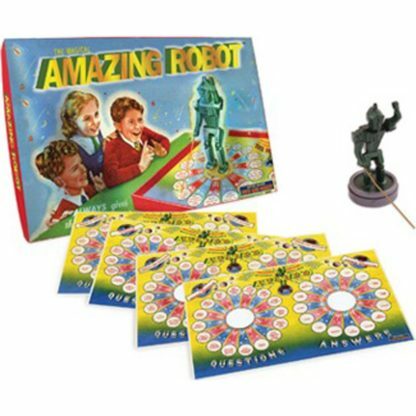 He is the AMAZING ROBOT! That is all you need to know! Put him in his notch, point him to a question and then place him on his mirror to find the answer – he is right every time. The set comes with lots of double-sided sheets of questions and answers and if you are really clever, perhaps you could make your own versions. Amazing – literally! 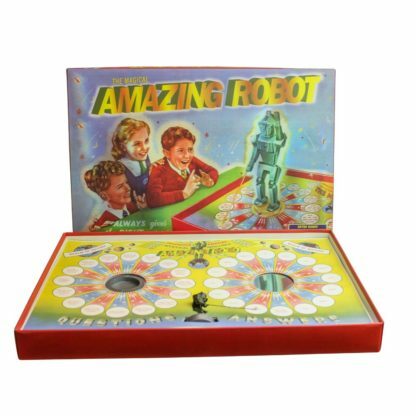 Children, and big children, will be fascinated by this clever retro toy. He knows the answers to everything!